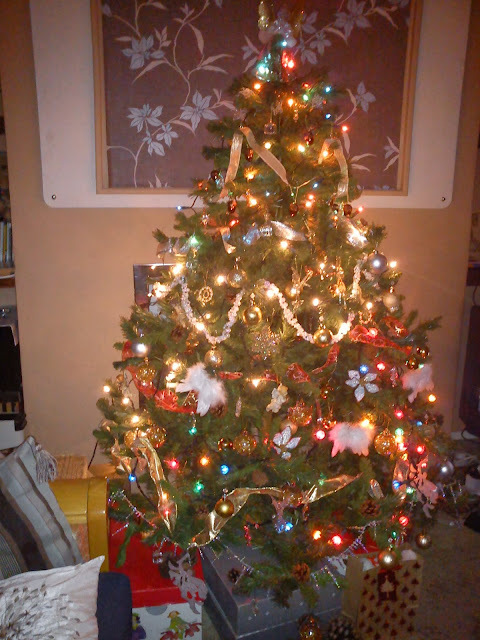 It's my blog's first Christmas! I don't do presents at Christmas so a lot of people assume that means I'm a bit of a Scrooge about the whole season. Christmas for me is all about time spent with family and friends I love to pieces. I've been feeling pretty nostalgic this December and put my tree up on the 1st when usually I put it up when I finish teaching round about the 18th or 19th. My lovely friend Chantal and I had a mini tree decorating party. Just her and me. The festivities involved: good food Christmasish music quite a bit of mulled wine and the inevitable set of lights which didn't work, The result was this shining example of a Christmas tree you see before you. It's always a fake tree because being South African I don't know any other kind.